In business, you learn about the concept of sunk costs. I’m amazed at how few people outside of the business world are aware of this idea, let alone apply it to their personal lives. A sunk cost is a cost that has already been spent and is unrecoverable. When planning for the future and deciding the fate of a project, you must look only at the additional costs required to complete it. People tend to make decisions based on what they’ve already spent (time/money/effort), instead of deciding if it still makes sense to continue moving forward (“I’ve already paid the deposit for the wedding reception, I can’t back out now” comes to mind). The phrase “irrational escalation of commitment” describes this phenomenon. Reading. “I’ve already read this far, I may as well finish the blog post.” Wait…keep reading. Seriously. I recently booked a weekend trip through a travel agency. A few days before I was scheduled to leave, a good friend/chef extraordinaire invited me to a very special dinner event that I really didn’t want to miss. I had already paid for the trip in advance, so the money I spent on the trip was a sunk cost – regardless of whether I went on the trip or went to the dinner party, the money was gone. Ignoring that sunk cost, I was able to look only at the two options: go on the trip or go to the dinner party. That made the decision to go to the dinner party much easier. As a bonus, I was able to get a partial refund on the trip. Score! If you work for a corporation or went to business school, these two words probably make you want to throw up. They’re endlessly drilled into your head. Each company needs to identify and focus on its core competencies. For Apple, that’s creating consumer electronics that people love. Apple is not an expert in manufacturing – in fact, Apple doesn’t make a thing. They outsource most of their manufacturing to a company called Foxconn. Outsourcing allows them to spend more time focusing on their strengths. I believe that you should outsource everything possible that you don’t love to do – then, you’re left with a schedule full of things that you love doing. What better way to live? I absolutely hate dealing with medical bills. Whenever I go to the ER, which seems to happen at least once a year, I end up with a mountain of absurdly confusing medical bills. They make them confusing for a reason – so people like me (without a core competency in screwing over patients) get confused and pay bills that they shouldn’t be paying. I fight fire with fire and arm myself with an expert. For $16.50 an hour, I hired a medical billing specialist on Elance.com (a website for freelancers). She wrapped up a years worth of bills in a matter of hours, and the money I’ll save with her appeals will pay for her wages and then some. Plus, sticking it to the insurance companies is insanely satisfying. For outsourcing tasks, I recommend Elance, Taskrabbit, or Done. PS. Can you help me outsource my marketing by sharing this post on Facebook? This refers to an accounting principle for allocating inventory costs (exciting stuff, I know). Let’s look at the example of my kettlebell company. Say I have 10 units in stock, and I receive another 10 from my factory. If I get an order for one kettlebell, do I ship out one of the 10 that I had in stock, or one of the 10 that I just received? If you operate with the FIFO principle, you’ll ship out the oldest inventory first (i.e. the first inventory shipment to come in is the first shipment to go out). Grocery stores use FIFO – if you ran a grocery store with LIFO (newest inventory goes out first), you’d have a mountain of spoiled milk and rotten eggs. This is why the freshest milk is placed at the back of the grocery shelf – they’re trying to push out old inventory. In your life, you may be tempted to work on the latest tasks to come up – the newest email in your inbox, for example. This leaves you with a backlog of old, unfinished work that lingers in procrastination purgatory. Go back into the figurative warehouse, dig out the old, ugly inventory tasks, and ship them out the door. You’ll feel better having a clean, fresh, uncluttered mind. 80% of the benefit from 20% of the work. 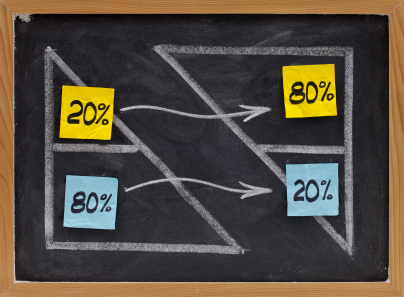 Successful companies routinely perform 80/20 analyses on all aspects of their business – which 20% of our customers account for 80% of our revenue? Which 20% of our customers are responsible for 80% of our headaches? Once these questions are answered, they seek out more customers like the former, and cut loose the latter. Use this lens to evaluate your life. Which 20% of your activities deliver 80% of your satisfaction? Which 20% of your friends give you 80% of your problems? The benefit of being the boss is that I can fire people. Well, if I had any employees, I could (everything I do is outsourced or automated, so I’m a company of one). But I can fire contractors, I can fire suppliers, and I can fire customers at my own discretion. Guess what – you’re the boss of your own life and have absolute control over with who or what you associate yourself. In business, there’s lean manufacturing, lean enterprise, lean production, lean leadership – it’s all collectively referred to as “Lean.” This is a school of thought that encourages businesses to eliminate any production practice that does not add value to the end customer. Examples of Lean can be found in almost any field – Toyota used Lean principles to transform from a small nobody to the world’s largest automaker. In medicine, it’s called the “minimum effective dose” – the least amount of a medication required to have the desired effect. Peter Drucker famously said, “[t]here is nothing so useless as doing efficiently that which should not be done at all,” and that quote has stuck with me. It’s belief in this principle that separates the smart worker (you) from hard worker (everyone else). a. Define the “end customer” of your life. This will usually be yourself and your loved ones. Make a list. b. Eliminate unnecessary processes. That means you should cut out any activity that doesn’t add value to the end customer – these are tasks that you’ve undertaken out of guilt or habit, but you don’t really enjoy doing at all. c. Reduce production time. For any activity that does add value, reduce the amount of time it takes to complete that activity. We all need to make money, but that doesn’t mean you have to work eight hours a day. In order to reduce my time spent earning money, I started and automated two companies – now I work a few hours a week and make more money than I did before. d. Decrease inventory. You can interpret this how you like – but I look at it as eliminating excess baggage that doesn’t add to your happiness. That includes people who don’t add to your life, lingering anger or resentment that you haven’t dealt with, or even clothes that you don’t wear anymore. If you liked this post, can you help me by sharing this post on Facebook? Do you have any other business concepts that you’ve applied to improve your life? Tell me about them below! This entry was posted in Entrepreneurship, Lifestyle, Philosophy, Productivity and tagged 80/20 principle, automated income, best practices, Buenos Aires, change your life, commitment, efficiency, entrepreneurship, friendship, happiness, health, Lean, outsourcing, personal development, philosophy, procrastination, productivity, quitting your job, relationships, sunk costs, Well Being by Zack Kanter. Bookmark the permalink. I was thinking of writing a blog called: “The Business Case of Your Life”. The title is quite self-explanatory.. I want to explain how you can actually apply the same concepts that you use in developing a proper business case in leading your life. Reblogging one of your posts was overdue Zack! Another excellent one! Inspirational as ever! Your outlook of alleviating negativity and issues that cause a lot of stress in most peoples life ‘money,’ instead of worrying that we’ve had value or feeling forced due to cost, mark it own to a sunk cost. Irrational escalation of commitment pretty much somes me up so your posts really help me get things in perspective. In respect to core competencies and outsourcing, this lesson was demonstrated to me in property investing where costs can spiral from exceeding deadlines or error resolving. I’m currently embarking on a new venture and instinct drives a lot of us to try and do everything ourselves to keep costs down, thank you for the reminder that this can be a false economy. I really enjoy reading your blogs. I hate the thought of “business” in general, and incorporating some of its aspects into my personal life is something that I never thought about–or rather, preferred not to think about. I am interested in taking up your tip on “outsourcing” in particular. I feel that your example is a great demonstration of ROI. Thanks a lot for this post. Sharing on Facebook!! Pingback: Don’t be a Pigeon « LIGHT, BE! I like using the first in – first out method although it seems that so often, I find myself at a standstill because of something I have to wait for in order to finish. That’s when I go to the next thing and get myself tangled up in too many projects at once. How do you handle the wait? I’m really enjoying your posts. I have shared this one on facebook. Thanks for the inspiring me to think differently about time and money. Reblogged this on A Doxophobic's Blog. Loved it, a very refreshing view. I love the concepts, especially no1: Sunk costs and the Irrational Escalation of Commitment. I have started to implement that one about last year, and it just works great! I very much like your style of writing and you seem like quite a “deep” person. Someone who reflects a lot on life perhaps…It’s very interesting and inspirational to read your posts. One thing though, is that it seems that for a lot of your “ideas/concepts” you need money to implement them, like with n°2: Core Competencies and Outsourcing, where you explain that :”I fight fire with fire and arm myself with an expert. For $16.50 an hour, I hired an medical billing specialist on Elance.com (a website for freelancers)”. My question is: Is it doable? Obviously it seems to be for you but I take my case for an example, I don’t have that kind of money to “outsource” what I don’t like doing…or paying 200 dollars EVERY MONTH (?!) to maybe have a shot at starting a small company to then apply n°5 “Be lean” and Reduce my production time. I have been trying to reduce my production time. Making the money worth my time, effort and work put in but it honestly seems like a vicious cycle that never ends, like if it Always came down to money. So, do you think there is any way of maybe making it a bit more “applicable” to a larger range of people? With regard to the $200/month cost of ImportGenius.com, which I mentioned in another post – I suggested signing up for one month. You should be able to collect more than enough information in a month (or in a week, for that matter) to get you started. Creating a business isn’t free. There is some initial investment required – I wish I could tell you how to do it without startup money, but it just isn’t possible in a lot of cases. In order to start saving some money, I highly recommend reading Ramit Sethi’s book, I Will Teach You To Be Rich .